Providing you the best range of single disk metallography specimen grinding & polishing machines, double disk metallography specimen grinding & polishing machines and metallographic specimen mounting press with effective & timely delivery. 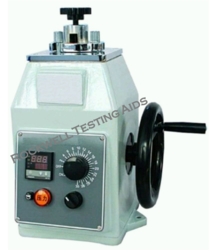 Speed Range Variable Speed 50-900 rpm (control through knob). 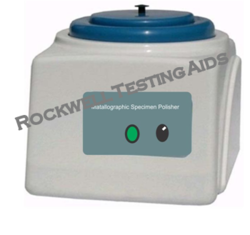 Metallography specimen polishing machine is suitable for the polishing of the specimen which has been grinded. The specimen surface is very smooth after processing and can be used to observe and measure the metallography structure of specimen under microscope. Speed Variable control speed controller (Crompton Greaves) 2 No. High Torque 1/2HP high torque DC motor(Double Motor) 2 No. The mounting press is a mechanical type machine. By turning the hand-wheel of the machine, a couple of bevelgear is rotated to drive the screw rod which in turn pushes/pulls the lower die up and down along the mould sleeve. The thermo set plastics together with specimen being mounted is formed under heated conditions. During this process the pressure is self adjusted by a spring fixed inside the machine. A signal light is used to indicate the pressure level. The mounting press is equipped with a digit temperature controller to establish real-time temperature meanwhile, a timer is equipped to realize the semi-automation of sample – making, while obviously increasing working efficiency. For each specimen mounting, 8-10 minutes is enough and a mirror-like specimen can be acquired.